Some power cruisers are boring. The Formula 370 SS is anything but. When we’re filming a video boat review and the photo-boat can’t keep up with me, I know I’m on a red-hot boat. 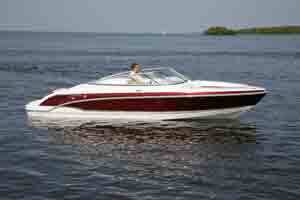 Check out our video review of the Formula 370 SS, and you’ll see what I mean. When I nailed the throttles, I left our videographer in my wake. Nya-nya! 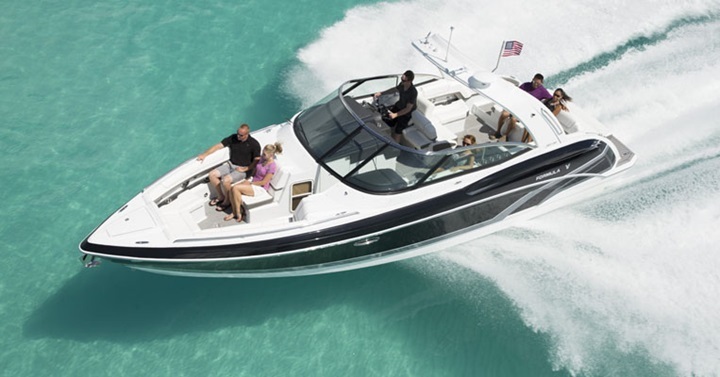 The Formula 370 Super Sport earns its "Sport" designation with performance and handling that's far better than expected than your average cruiser. 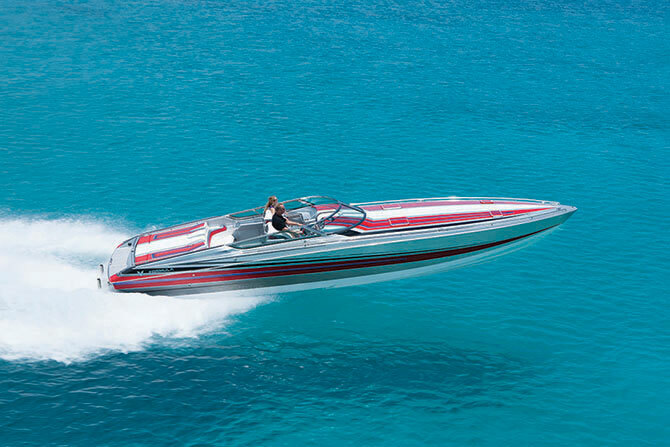 Now, I don’t want to give you the wrong impression—this isn’t a die-hard performance boat, and top-end isn’t eye-watering. But we did hit 54.0 MPH, and cruised at over 40 MPH. Remember, this is a 37’ long, 10’9” wide, 15,100 pound boat, with the amenities and comfort you expect from a full-blown express cruiser. 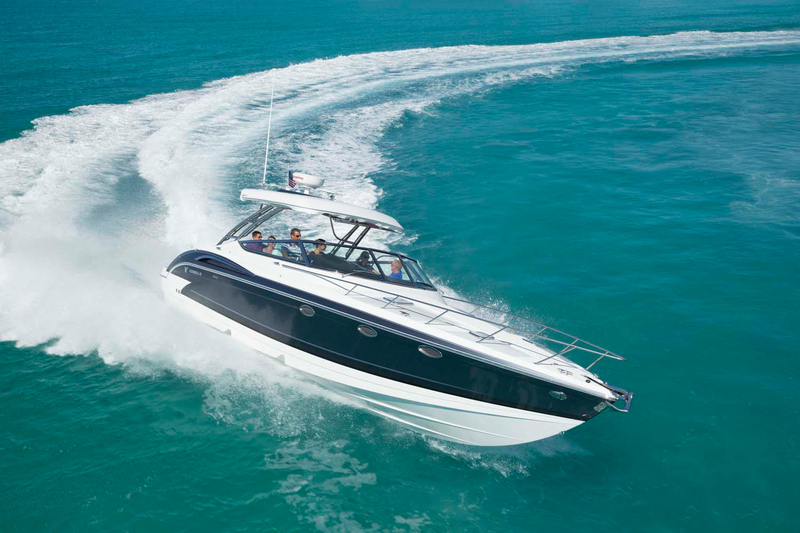 Most competing boats of this genre give you a cruising speed and a top-end that’s 10 to 20 percent slower. 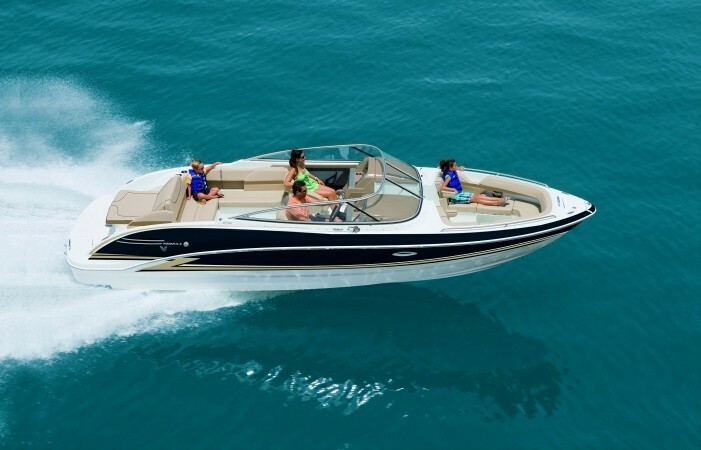 And most boats that exceed the Formula’s performance are so focused on top-end that they’re designed significantly narrower and more Spartan. How does Formula get this much speed out of a footprint that’s more Rockport than Reebok? A good deal of credit goes to the twin-stepped hull, which tapers down to 21 degrees of transom deadrise and a keel pad. A bit of credit also goes to construction methods, including the extensive use of Corecell coring in the hullsides and foredeck, which saves on weight while increasing stiffness. Fortunately, while Formula does maintain a focus on building boats with performance that beats the competition, they don’t go overboard in an attempt to cut weight. Shaving off pounds is one way those go-fast speed boats eek out additional MPH, and it’s also one of the reasons cruisers may find them lacking. Thin plastic drawers may be fine for a speed freak who only goes into the cabin when it’s raining, but a cruiser will prefer dovetailed wood drawers that don’t crack or break when loaded with heavy gear (like the ones found in the 370 SS). And a go-fast guy might eschew the extra weight of that removable cockpit dinette table, but a cruiser prefers to have it handy for cocktails and appetizers at sunset. Again, the 370 SS fulfills this need. There's plenty of seating and entertaining space, in the cockpit of the 370 SS. If there’s any one place Formula did go overboard, one could argue that they ate up too much cockpit space with an oversized wet bar. It runs most of the length of the cockpit along the port side of the boat, has a sink, trash bin, stowage, and refrigerator, and leaves room for just a small two-seat lounge forward, across from the helm. One could say it’s overkill. But I won’t. Because between the starboard-side U-shaped lounge, the double-wide helm, and the port lounge, there’s enough seating for 10 people. 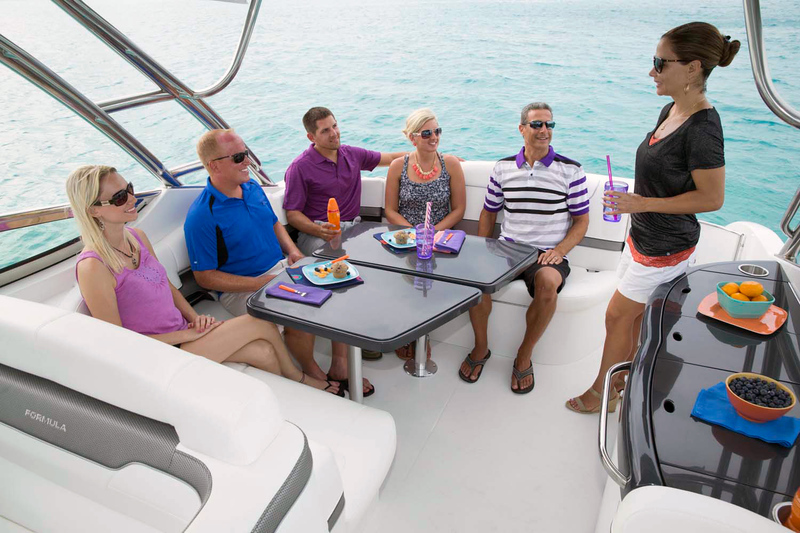 And if you have more than 10 people onboard, it’s a fair bet that a smaller wet bar wouldn’t be big enough for all the fixin’s and drinks you’ll need, anyway. Speaking of being big enough: the cabins in super-fast speed boats are usually so low and narrow that being inside one feels like sitting in a two-man tent. The flip side, of course, is that on most slowpoke cruisers you get a big, fat cabin with gobs of room and a semi-private berth or two. As with performance, the 370 SS does a nice job of splitting the difference. In fact, it’s rather surprising just how roomy the cabin is, and it’s complete with a small galley, a mid-cabin with a queen-sized berth (though not much overhead room), and a forward dinette that converts into a V-berth. It’s ideal for entertaining, or for a couple or even small family who like to go weekending. 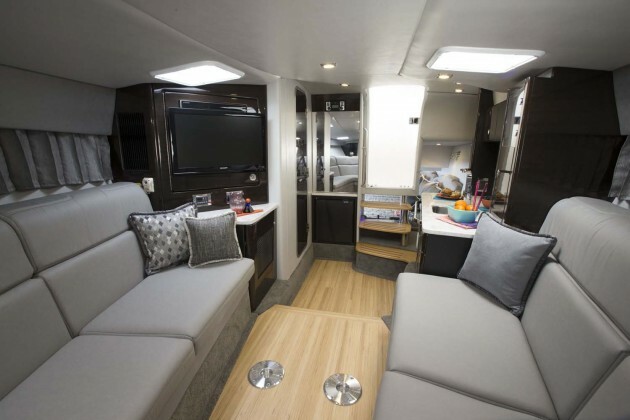 But there’s no real separation between either of the berths and the main cabin, so you probably won’t want to overnight with those who snore or with multiple couples. The cabin inside this Formula is surprisingly large, but is also open to the mid-cabin and V-berth. There’s also an entertainment center with a flat-screen TV, and if you haven’t already watched our video, I suggest you take a look at it now. Specifically, look at the segment at 3:10. When we swing back the TV, you’ll see that Formula encased all the wiring and cables in flexible conduit. That’s an extra step most builders simply wouldn’t bother with. And every time you open a compartment, look under a seat cushion, or remove an access hatch anywhere on this model, you’ll see more of the same. Formula not only makes sure the 370 SS looks good on the outside; they’ve taken extra steps to ensure that the fit and finish is more than skin deep. Wait a sec—doesn’t all that extra detail work add to a boat’s cost? You bet. The 370 SS is not exactly inexpensive, and depending on power choice and how crazy you want to get with options, you could push the sticker price beyond the half-million mark. Just for the record, the powerplants in our test boat were the MerCruiser 8.2 big-block V8’s, linked up to Bravo III outdrives. And although it’ll boost that price tag (by around $16K), another option that was on our test boat which I’d highly recommend is the Axius system. The marina we ran out of had a tight, twisty channel, which we had to navigate in a stiff cross-breeze. Just getting down that channel, much less putting the boat in its slip, would have been seriously challenging using nothing but the wheel and throttles. With the Axius joystick, it was a piece of cake. The bottom line? 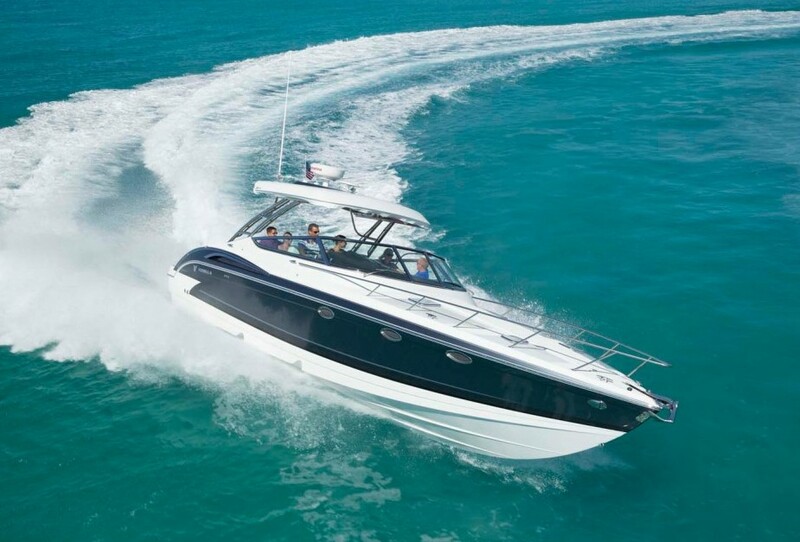 If you’re yearning for speed, speed, and more speed, this probably isn’t the right boat for you. And if you want the biggest, fattest cabin around on a cruiser of this size, keep looking. 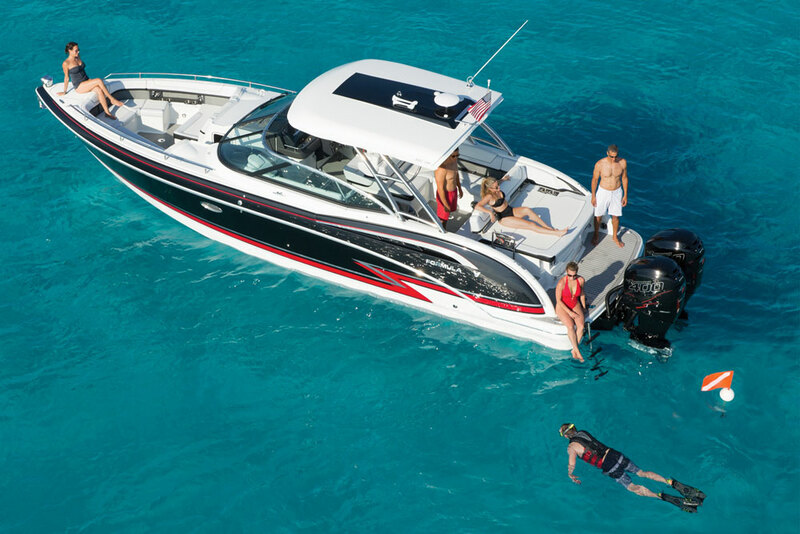 But if you want a cruising-capable boat that offers a mix of weekending and entertaining ability, along with spicy performance that your average 37 foot cruiser can’t touch, the 370 SS is an option you’ll want to consider. Other Choices: The Monterey 360SC and Regal 38 both place a bit more emphasis on the cushy factor and a bit less on performance. 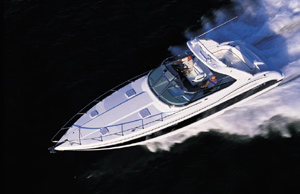 Those who want a slightly scaled down, less expensive cruiser may want to look at the Beneteau Gran Turismo 35. For more information, visit Formula. Or, see some current Formula 370 Super Sport listings. Test conditions: calm seas, winds 5 knots, 1 POB, half fuel. Power Twin Mercruiser 8.2L MAG HO Bravo III stern drives, swinging 28" propsets.